Very cool. I’ll be looking into this. I *hope* you corrected the beyond stupid note that came re: using the compass, in which the reader was instructed to “reverse the reading” when in the southern hemisphere. How anyone capable of publishing a book could be so bloody ignorant as to not know how a compass works is beyond me. One can only hope that the perpetrator is lost at sea with a compass one day and spends his/her last days oscillating back and forth across the equator. I hadn’t noticed that, but I’ll be sure to make sure he knows better than that! Cool. Never thought I would see a D&D pop up book. That sounds like an excellent combination of books! There needs to be more of this kind of stuff. Immersive props used to be a great part of old Tabletop and PC games back in the 80’s, I’ll never understand why it never continued. This totally walks lockstep with my obsession with props and bonus interactive fiddly bits haha. Totally can’t wait for this to come out. Seems like a cool little folio. Plus a return of Volo…I’m in! I sure would love a copy of this book. An chance of it being autographed by Matt F.? Not likely from our end. We got the review copy straight from Candlewick Press. I know Matt is often at Gencon as a convention, and you might be able to get a copy signed if you track him down there or at another convention. I’ll probably buy a copy if I don’t win this one. I don’t have any experience with the Forgotten Realms setting, but the “scrapbook” build is too alluring to ignore. A thing of visual beauty. Okay dice gods…. now is the chance to redeem yourself for being such fickle $#@%!@#! Well, Anything Realms related, especially if it has a map, is a plus! If I do not win, I will have to take a peek at it in the store beforehand. Curious, did the review copy come shrink-wrapped? Might give me a clue how difficult it may be to peruse it locally. It did not come shrink wrapped. I’m guessing the store copies will be like the other ones in the ology series and made for perusal. Sure, throw me into the pot for the freebie. It seems a pretty nice book! I love stuff like this, “fluff”, lore, extras. That does look amazing and I had no idea it was even coming out. Thanks for the review (and giveaway). TYMORA, BRING ME THAT BABY! I love the OLOGY books! This one looks like a great addition. Very neat, it looks like a fun way to introduce new players of any age to the setting. Looks wonderful! My kids would love it (as would I!). Oh my goodness! I’d love to grab a copy, it would help immeasurably with teaching my younger siblings to play! As a parent that runs a game for kids 10-13 I can see this being really well received. Come on dice gods! I’m in love with this book! WOW… that’s some marvelous art! As a newcomer to D&D I would love a chance to have this book. Such an exciting hobby. Looks like a really interesting book I’ll happily take yours off your hands for you. Oh, I really want to win this one! Very cool! This would be a wonderful audition to my collection. More books like this one, please! This would be great to add to my ever expanding dnd book collection. If I don’t win (I really hope I do!) I’ll definitely buy it. How much I want it…???!!! I’d love to get my hands on this! It seems like a very cool release that newer role players and lore geeks alike can enjoy! The price tag is very reasonable for a book like this, with all of its fold-outs and extras. For folks who are more inclined towards visual and tangible stimulation, the contents are sure to please. A low cost intro to Forgotten Realms and great collector’s piece! 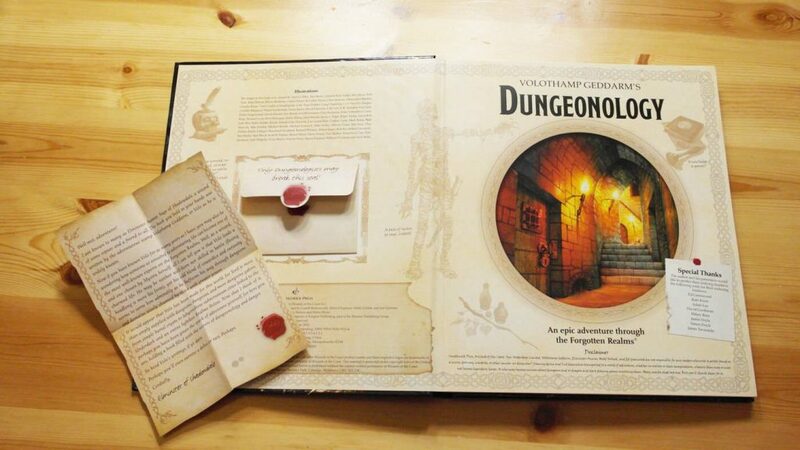 This would be a great addition to my ever expanding library of rpg tomes! Great review guys! Keep up the good work! Thanks for the review! I’d love to win it and save $25! I would love a chance to win this fine book. Thank you for the giveaway and the review. I’m in for the giveaway! If I get it I will add it to the door prizes for our Extra Life event! Winning that book would make me so happy! Never won anything through one of those internet giveaway but while I’m losing hope, maybe this time is the right one.